SHUT YO MOUF! (story below) It was a decent week of fishing despite the full moon and a bit of a storm that blew through! There's not alot of roosters this time of year, but the ones that are around tend to be LARGER models! Our good amigo, Belmond Mann from Oregon had a banner day. He caught and released two big 50-60 pound roosters just off the area near the Las Arenas lighthouse shown just over his shoulder. He's pictured here somewhere behind the big rooster dorsal fin! There weren't alot of big fish caught this week, but there was steady action despite the weather and full moon. Still, some anglers did get into a nicer grade of fish and were fortunate enough to hang onto them like this fat yellowfin tuna held up by Captain Archangel for Victor Acevedo on his first trip with us. One of the best surprises of the week were nice schools of 10-25 pound yellowfin tuna for our La Paz fleet. Most of the season, the tuna have been with our Las Arenas fleet. 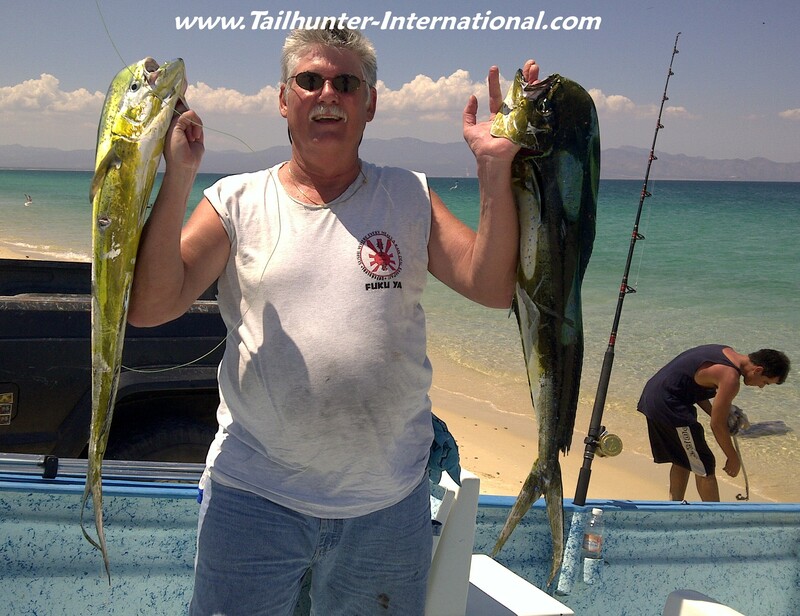 However, this past week amigos like Bob Hartsook from Arizona with Captain Raul got limits or near limits of tuna mixed with dorado just north of the city. It's great when the fishermen catch fish, it's even more fun when folks who don't have alot of experience or don't do alot of fishing get "lit up!" 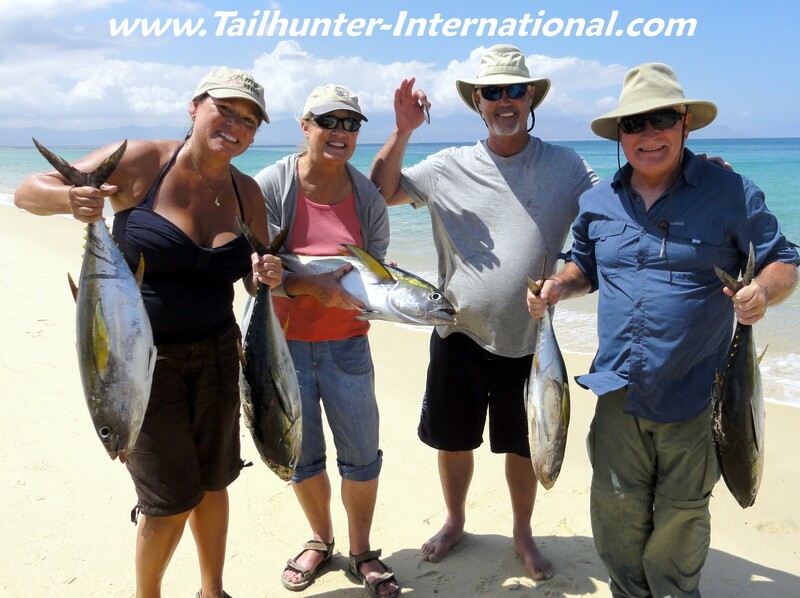 Our friends from Northern California, Jeanine and Roy Stenzil on the ends and Nancy and Zav Lerch in the center celebrate a good day of tuna fishing with our Tailhunter Las Arenas Fleet. They also got dorado as well. Jeanine and Roy liked La Paz so much they built a house! They say it's better to be lucky than good. John Ames from Pomona doesn't have alot of experience, but every time he comes down here to fish with us he's off the charts. There may be no marlin biting and he'll say, "Today I want to catch a marlin." He catches one. He'll fish for dorado when there aren't any...and he catches them in bundles! This particular day, he said he wanted to target wahoo. I told him there haven't been many wahoo lately. He said that was ok. He got FOUR WAHOO hooks ups! He lost two when the Rapalas broke, but still got 2 nice sized wahoo logs shown here with Captain Armando. Great fishing! Yes...there are still pargo biting. These might not be the biggest, but these are still tough fish to pull out've the rocks. These pargo liso (mullet snapper) were taken by Neal and Jess Helms. When you're 11-years-old and it's your first fish, it's the biggest and best thing in the world. Stone Urzua from Modesto just kept asking if he might get into the fishing report! I couldn't let him down. Just like he didn't want to put down his dorado so they could clean it! Good job, Stone! 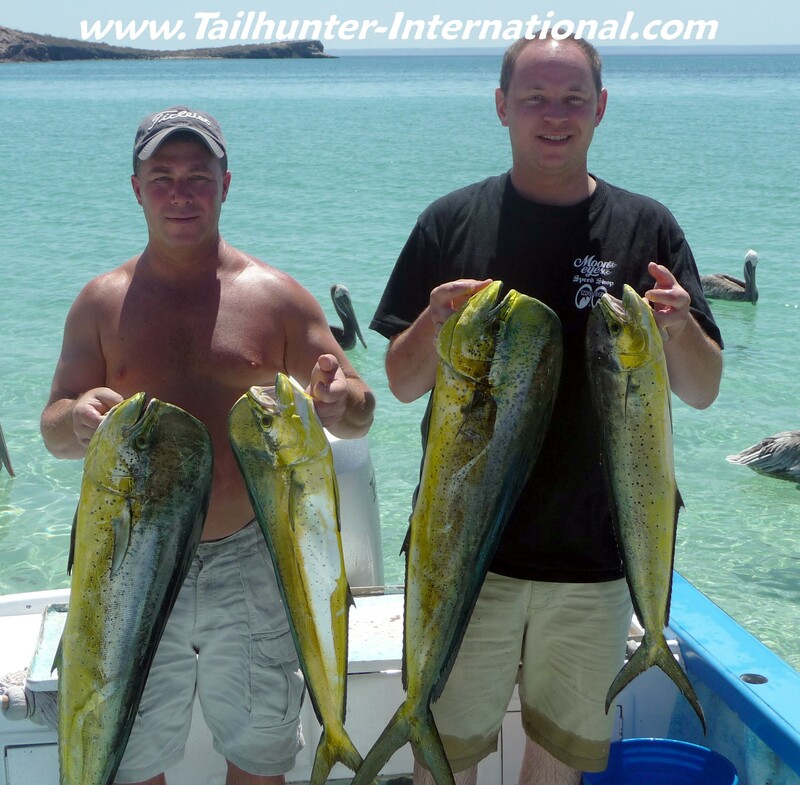 If you want to get a shot at dorado, that's the bread-and-butter fish with our Tailhunter La Paz Fleet. Limits or near limits most days like the 4 held here with Vic Acevedo and Craig Freeman in Balandra Bay north of La Paz. Wally and Jeff Lee from San Francisco had a pretty good week with a great mix of tuna, dorado, pargo, snapper and cabrilla to take home after 5 days of fishing! 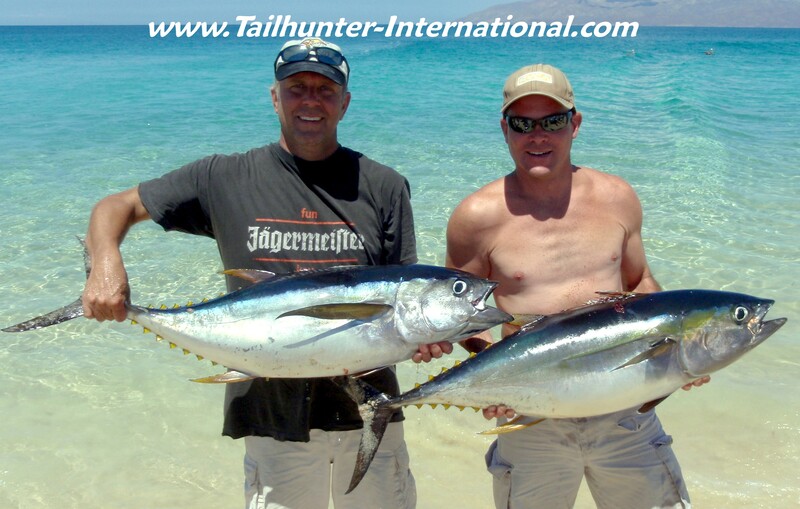 As mentioned above, we had some real banner days of tuna fishing with our Tailhunter La Paz fleet as schools moved into the channel between the islands. 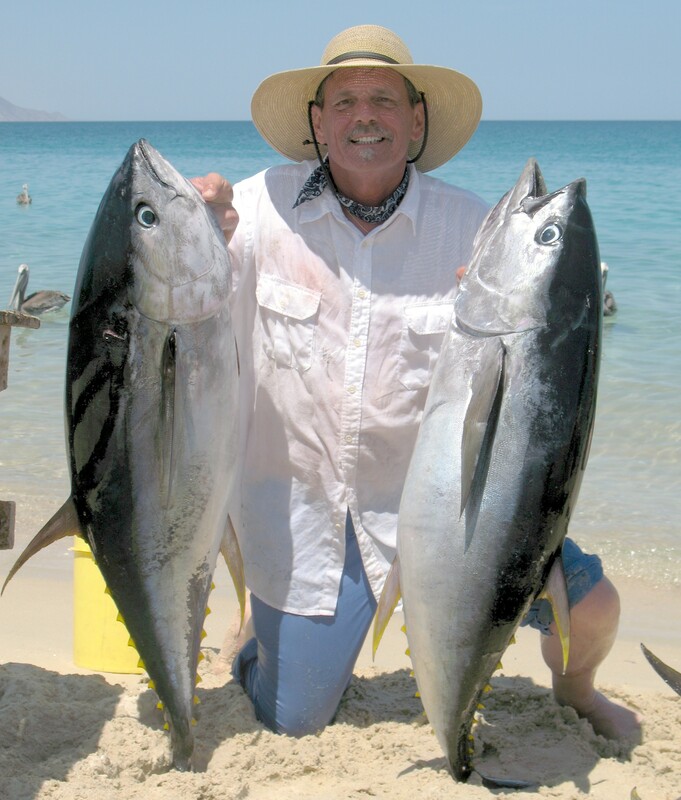 The tuna pretty much upstaged the normally great dorado fishing we get. Warren Grande from Santa Cruz CA grins and holds up two of his limits of tuna. This is how we often start out the morning...catching giant sqiud for bait. All the boats are packed tight and it's a workout sometimes pulling these things up from as much as 1000 feet down and they come up squirting like a firehose! Get that thing in the boat and try not to get drenched! Beast coming aboard! Stay away from the tentacles and beaks! Fish and people love 'em...ready to be cut up for bait or headed toward the dinner plate! FULL MOON AND A DAY OF STRONG WINDS DON”T DETER THE FISH…MUCH! We spent a good part of the week watching the weather pages on the computer as “Georgette” went from a little whirl of clouds to the south of the Baja Peninsula into a Tropical Storm. Cabo got alot of rain, but when all was said-and-done, we got enough rain to mess up the dust on the windshield of our car and make it streak. La Paz barely got a puddle although near Las Arenas, they did get a bit more rain. For our area, some spots got a bit of drizzle and others got a nice welcome rain. However, for fishing, it was really the day AFTER the storm that affected us because of the winds. I guess we could have gone fishing, but there was no sense in being uncomfortable so we told all our clients to sleep in and told the captains they had a day off. Everyone actually seemed to welcome it so Wednesday was the first day since March that we didn’t put any boats on the water! That being said, right up to that day and kicking in right after, we were able to keep doing some really solid fishing. Not alot of big fish this week, but steady enough and decent enough that everyone got into them and the rods kept bending! The biggest news was that for the first time all season, we’re getting tuna now with BOTH our La Paz and Las Arenas fleets. 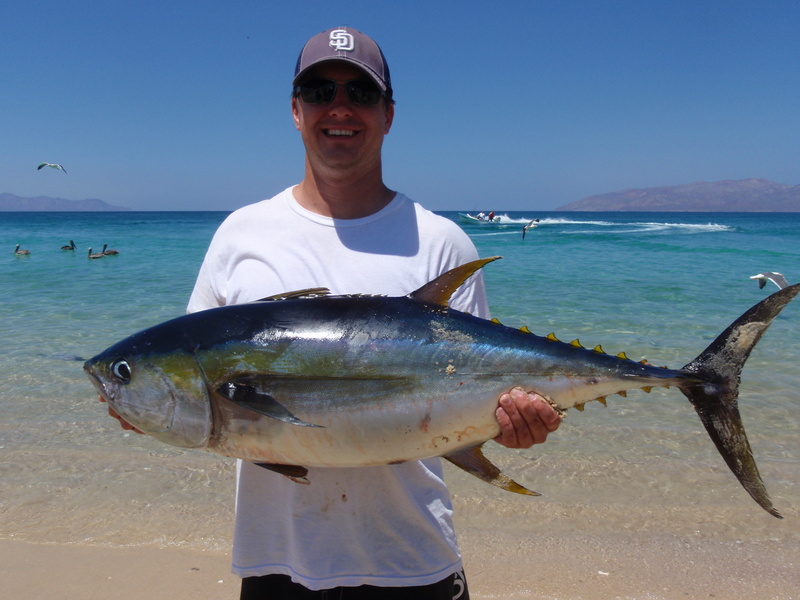 Football-sized yellowfin in the 10-25 pound class are being caught by our anglers working both sides. Normally, most tuna are caught only with our Las Arenas fleet and indeed, it has been a banner year so far on tuna out of Las Arenas. However, this past week, it got pretty consistent with at least half the boats one each side putting nice yellowfin tuna into the boxes. The fish are popping up in various spots…north and south Cerralvo…Punta Perrico…Punta Arenas…the Ridge…the Dome…El Rosario…Las Cruces…off Bonanza Beach. You just never know where the schools will suddenly come ripping through the lines and get the reels screaming! Just because most of the fish were party-sized doesn’t mean the big ones weren’t around. We just didn’t seem to get many hooked up this week. But there were a few stories from guys who hooked “freight trains” that they never saw and that hit like trucks and never stopped leaving only smoking reels and limp lines! 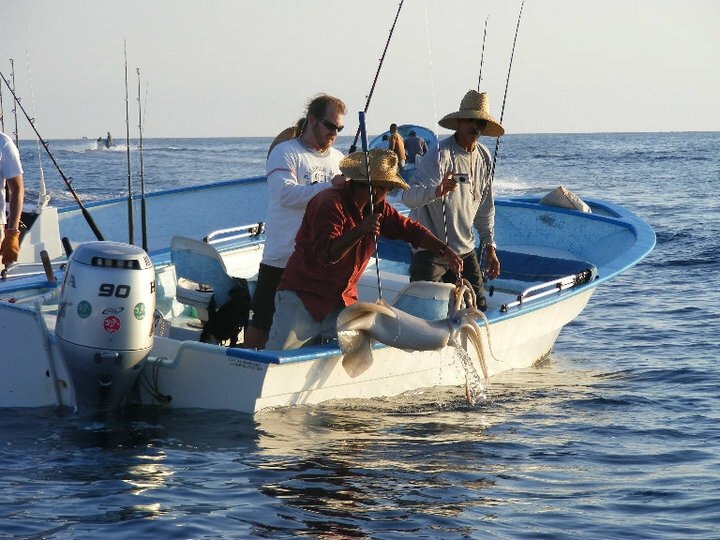 The rest of the catch was rounded out by limits or near limits of dorado for most boats and most days. Some days better than others and some boats would do better than others, but mostly, decent sized dorado from 10-15 pounds were the norm with the occasional 20-25 pound fish. This year, we just haven’t seen any of the monster 30-60 pound bulls we normally see in the late summer and fall. It’s been a year with lots of dorado, just not alot of BIG dorado. Other species include some big roosters still hanging out at the shallows up to about 80 pounds; pargo liso and dog-tooth snapper in the rocks; and we also hooked some striped marlin this week as well. HAPPY BIRTHDAY AMY! One of our best amigas comes from Oregon each year. Amy Mann is a gamer. For her birthday she had a wish list: (a) her first tuna ever and (b) a BIG tuna (c) her first marlin (d) a roosterfish. She got her first tuna then set her mind on a big one. This big 65-pound fill did the trick. She not only hooked it, but battled the fish herself for over an hour refusing any assistance or handing the rod off to her husband who kept trying to take it away! It was a good week for some of these larger models still hitting off Las Arenas with big squid chunks. Later in the week, she got two 50 pound roosterfish and a 200 pound marlin. Pretty good birthday! Ken Brady put this fat yellowfin tuna in the panga fishing off Las Arenas where we're having one of the best yellowfin tuna bites in many years. The fish are sometimes as close as just a few yards off the beach. Cradling it like a baby...Jorge Romero holds onto a 60-pound class yellowfin tuna. Jorge was out that one monster day when all the tuna were beasts. Jorge got 3 of these fish that day. Folks forget that we've got quite a few flyfishers here. It's just that we don't have many photos of flyfishers. Either they release most of their fish or flyfishing being a two-handed art form...they don't take many photos! 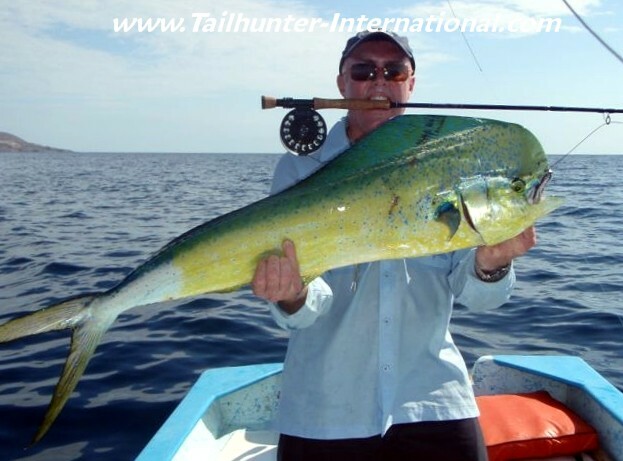 However, our Canadian amigo, Scott Olvier from Canada shows that dorado can be taken on the fly! S. Cal resident, Gary Evens also got into that monster bite of big tuna this week. 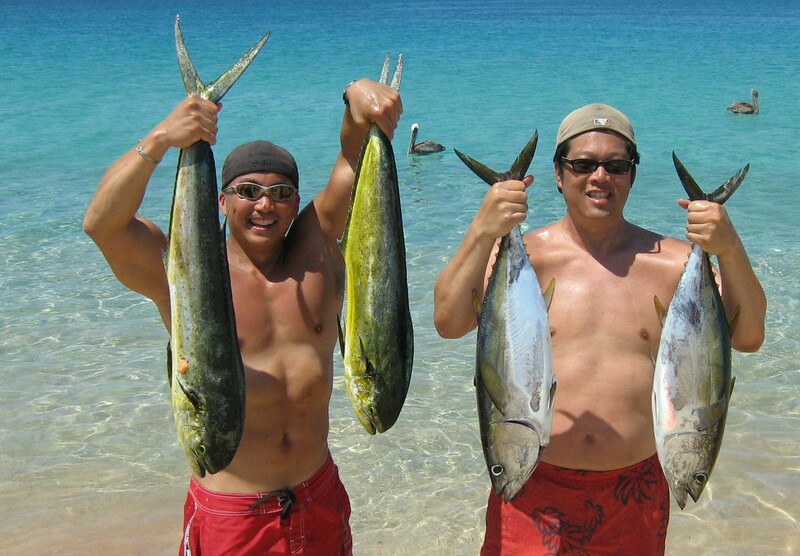 He poses here with a handful of double ahi. He also got a giant amberjack that day as well. Al Burgess comes to visit us every year all the way from Kansas and his first day crossed paths with this nice striped marlin. Unfortunately, on 30-pound test and having a bum arm, Al got as much as he gave. He eventually won, but the fish beat him up a bit too fighting for more than 2 1/2 hours and "pulling us all over the ocean" said Al. Also shown, is his wife, Kay, and Captain Jorge. Mike Koontz and Quentin Abramo always have a good time with us. Two of the 3 days they fished with us they had the largest fish of the group of retired firefighters. 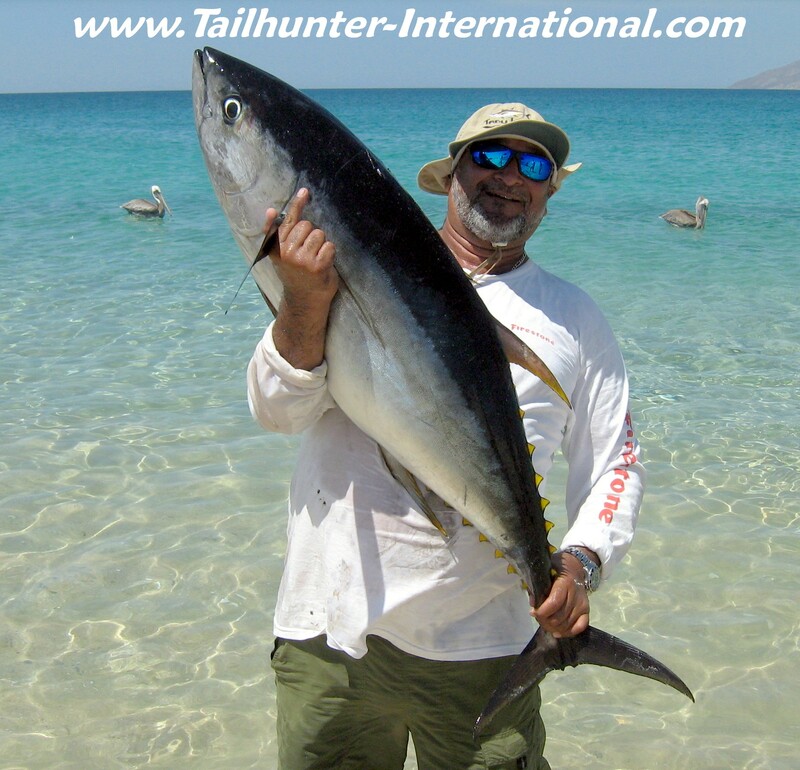 On his first trip to La Paz, Toby Ferner hit this 40 pound class yellowfin off the Las Arenas lighthouse. 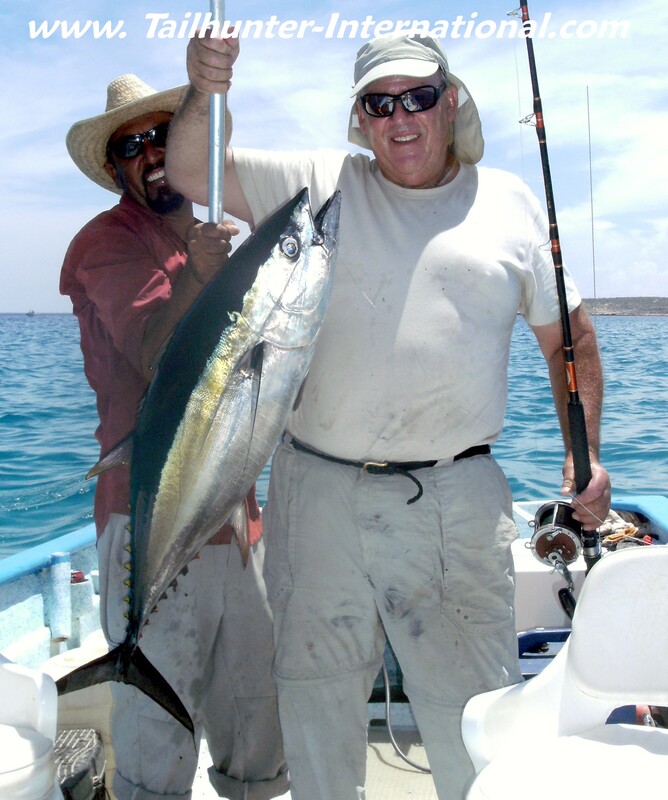 Dr. Bob Laughlin brought his father-in-law, Ralph Banks on his first trip to La Paz fishing. 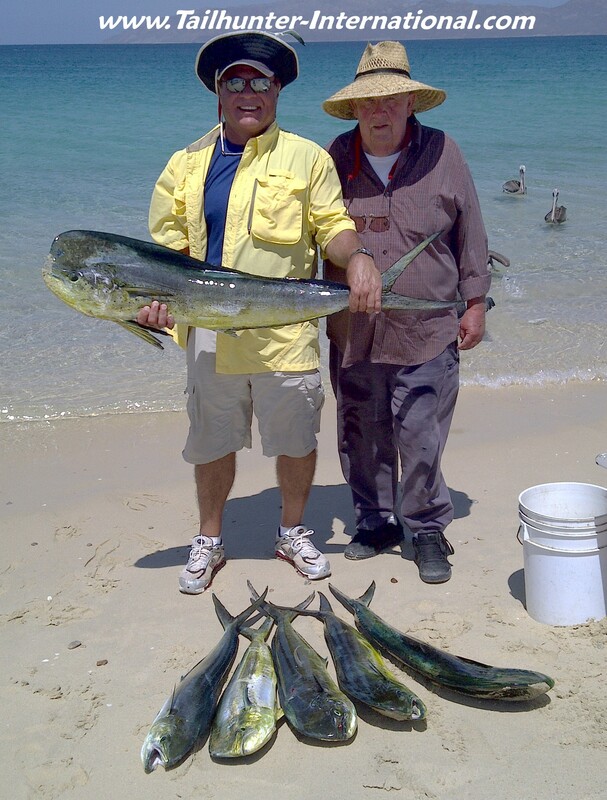 Dad did well catching a nice mix of tuna and dorado over 2 days fishing. We're seeing more and more dorado the last few weeks like the ones held up here by John Ames from Pomona CA. Most of the fish are in the 10-20 pound class and John got limits his first day out. 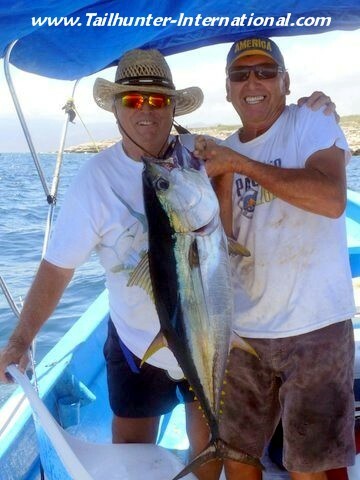 Wade White (right) was another amigo on his first trip to La Paz who did well with dorado and tuna right-off-the-bat. He's pictured here with his fishing amigo, Craig Yoder. 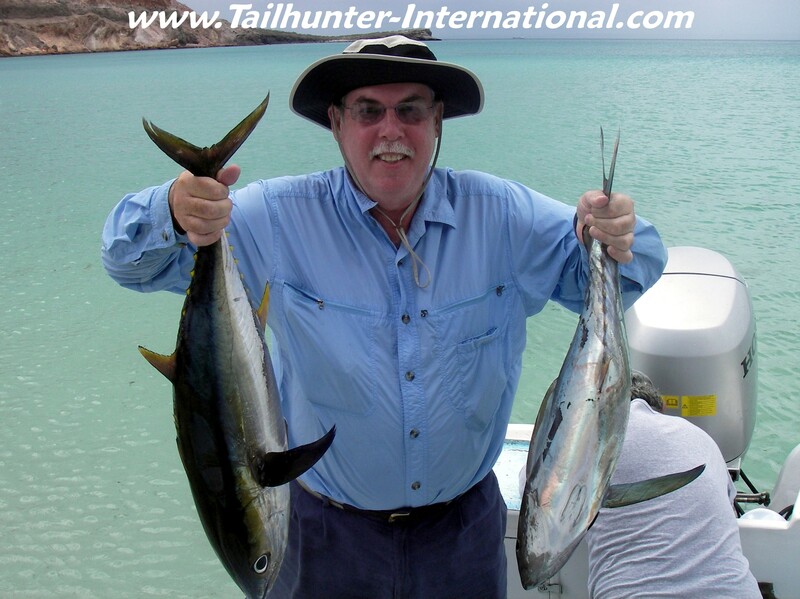 TUNA AND DORADO FISHING IN FULL SWING WITH A FEW DAYS THAT WERE OFF THE CHARTS! It wasn’t the best week down here, but it was a pretty darned good week of fishing and several of the days this past week might well be several of the most spectacular fishing days of the season. For the most part, calm waters and sunny skies continued to be good to our anglers who enjoyed the consistent bite of yellowfin tuna and dorado. For our La Paz fleet, daily limits of dorado were the rule rather than the exception mixed with sailfish and marlin biters. If anything, the two drawbacks were that most of the fish were in the 10-15 pound class with a 20-30 pound mahi being a “big fish” this week. Also, many days, the bite was late. “We had one fish in the box by noon and that was it. Our captain moved around a bit and then just sat in one spot for 2 hours with nothing but needlefish biting. We were getting a bit frustrated and wondering why he wouldn’t move or he was just wasting time. Contrary to that, as I said, some days were really spectacular. Mid-week the fish went kamikaze on us. Every one of our La Paz boats was back on the beach between 10 and noon! Some of the guys came back and had time to eat breakfast and their hotels because the fish attacked the boats! “My buddy and I had so many fish we were back at the hotel by 10 a.m. ! Our friends weren’t too far behind us. I’ve never seen so many dorado and it was hard to keep track of how many we were keeping and releasing!” commented one of our fishermen. 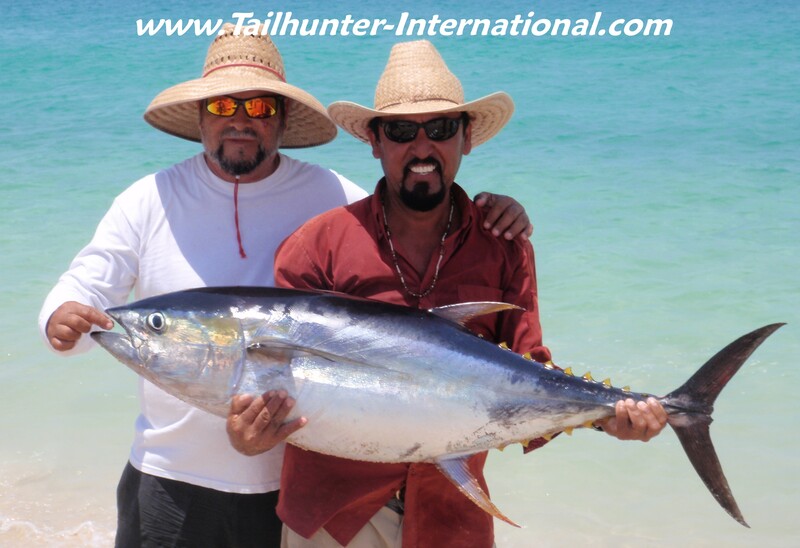 For our Tailhunter Las Arenas fleet, like I said, pretty steady for football tuna between 10-20 pounds and a nice mix of dorado in the 10-15 pound class. Everyone got fish although some did better than others on any given day. Most day were at least good but we had one so-so day when it seemed the currents changed and bait was hard to get. Still, most everyone got fish although we had to work hard for it. Let me put it this way…the SMALLEST fish we weighed that day was 30 pounds. The next smallest was 55 pounds! It went up from there! 60, 62, 65, 78…pounders! Other fish lost. Other fish beat guys up! One fish well over 80 pounds, but the scale wasn’t big enough and the nose of the fish was still in the sand! “I would say it was 100 yards long and 50 yards wide. The whole spot was alive with big tuna. You could look under the boat and see heavy dark shapes swimming by. I couldn’t believe how close to shore we were. I normally have to go on long range trips to see stuff like this! We were bent for 3 solid hours!” said another. 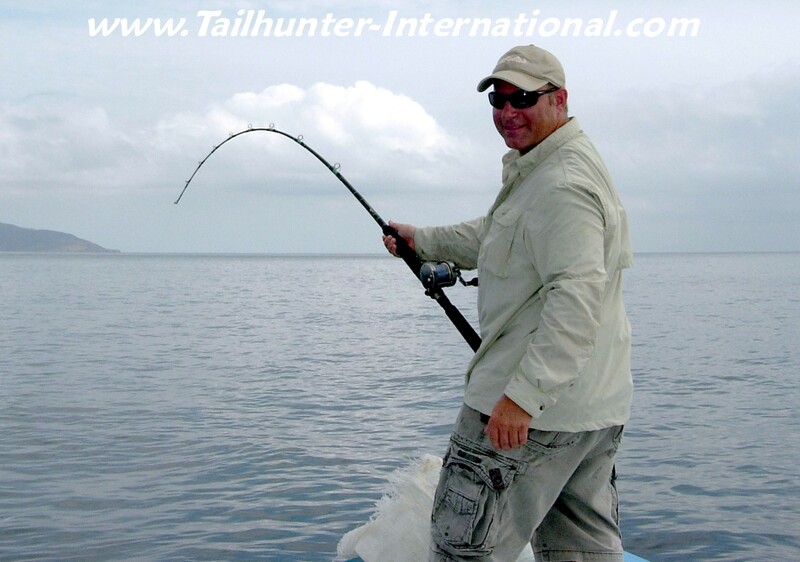 What a day…the next day…nothing…only the smaller fish and a smattering of the larger fish…one day…INCREDIBLE! If you were there, you won’t forget! When it comes down to it, this is what it's all about...THE SMILES! There's no cell phones. No interruptions. No traffic. No one yanking your chain except a big fast fish yanking your rod for all it's worth. The reel is screaming. The fish is actually towing the boat towards the horizon. It hasn't slowed down. You've already been on the fish for an hour and your rod and reel are awfully light! You're sweating and hot and you're wondering how you're gonna slow down this beast. Win or lose...you're having a blast! Tharon Ayde is a Sacramento firefighter in the busiest station in the city and couldn't be happier. 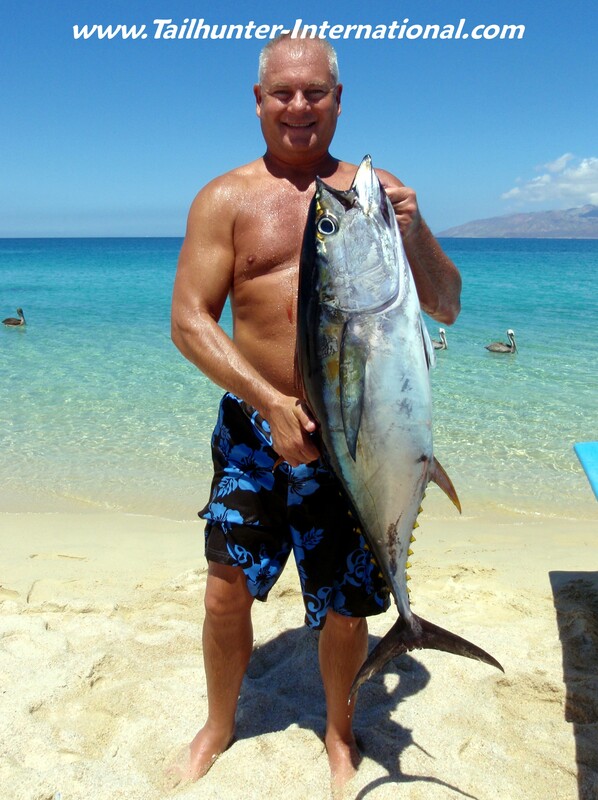 He eventually got this 50 pound yellowfin tuna! Craig Braswell just retired after a long career with the Sacramento Fire Department and has already made two trips to come fishing in La Paz since June! He holds up a big time 50 pound class tuna that ate a chunk of fresh squid dropped overboard. 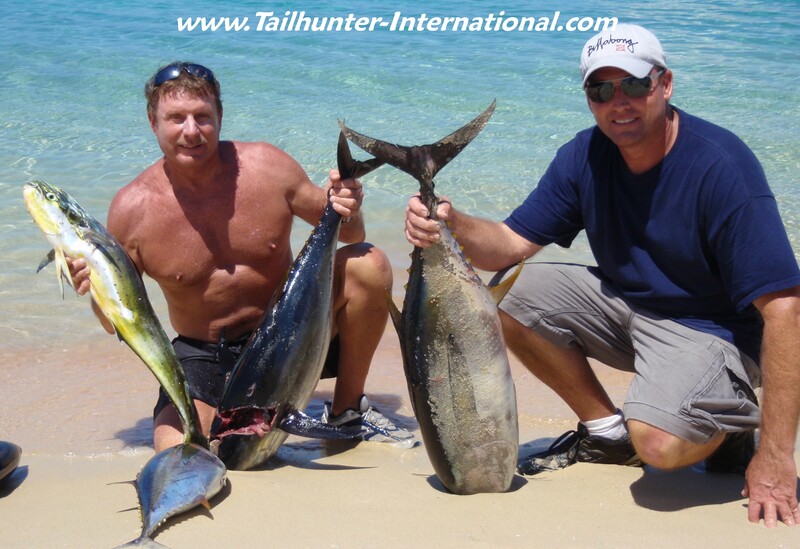 The tuna were so thick this particular day just off the beach that the boats were back by 11 a.m. completely full! 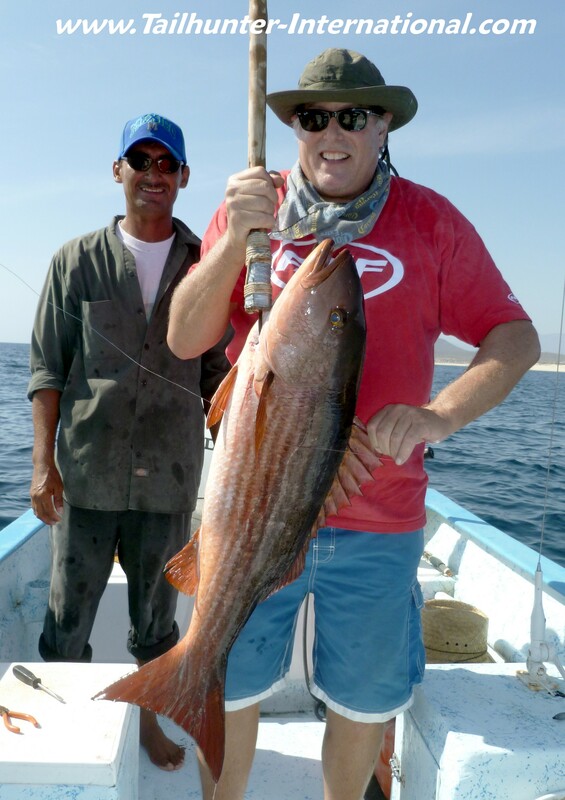 Pete Jensen from Orange Co. California kept trying for a big rooster each time he came to Baja. He finally got one. 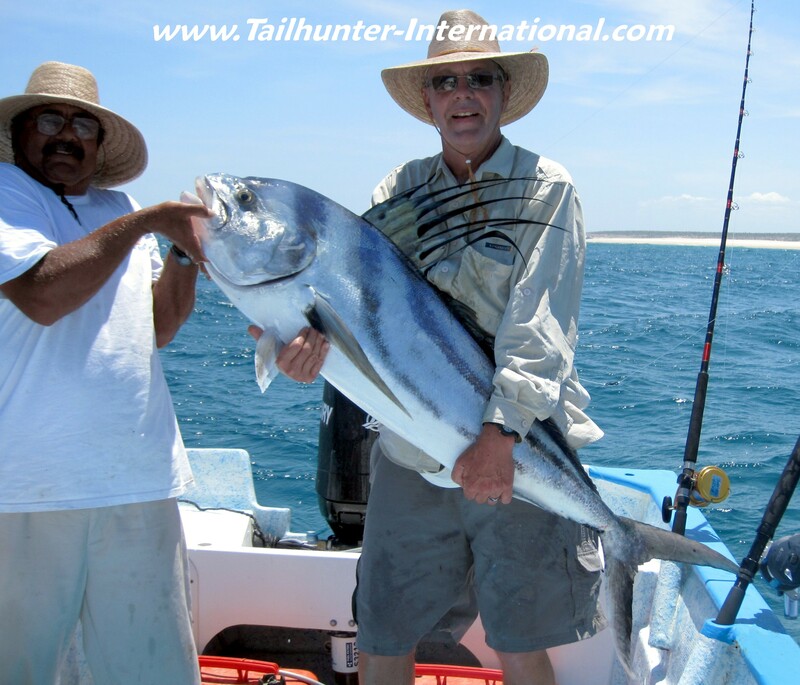 In fact, he got several large roosters, plus tuna, dorado and marlin fishing with Tailhunter International. This big fish was estimated in the 70-pound-class and caught on live bait. All the roosters were released. Captain Victor with the Tailhunter Las Arenas fleet lends a hand. 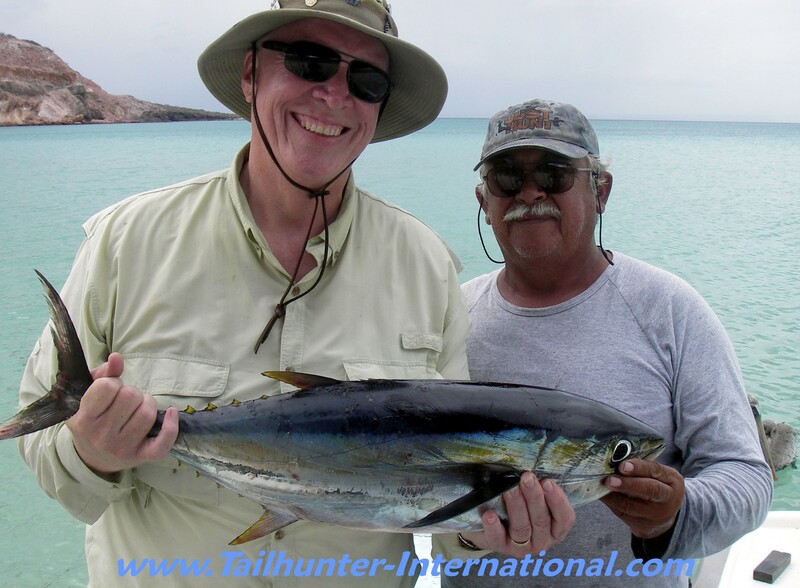 Captain Loreto and Jack McGuire are all smiles hoisting up another fat tuna they nailed in 5 days of fishing with both our Tailhunter Las Arenas and Tailhunter La Paz fleets. The fish started hitting for both our fleets with the bulk of the bite taking place just off the beach in shallow water near Punta Arenas. Santa Barbara amigo, Bob Duncan goofs with a dorado carcass and his daughter Emily and Jorge Romero off Las Areans Beach after a good day of dorado fishing. 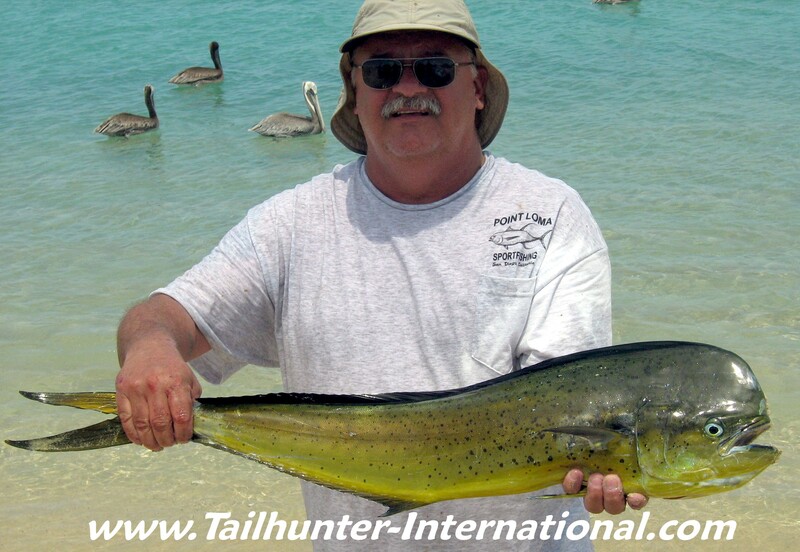 More dorado were coming on strong this past week with larger fish finally starting to show. All the way from Logan, Utah, Jerry Fickas first trip to La Paz produced numerous dorado and tuna like this one after 4 days fishing plus several fish that "couldn't be stopped" before busting off. Presumably larger tuna! 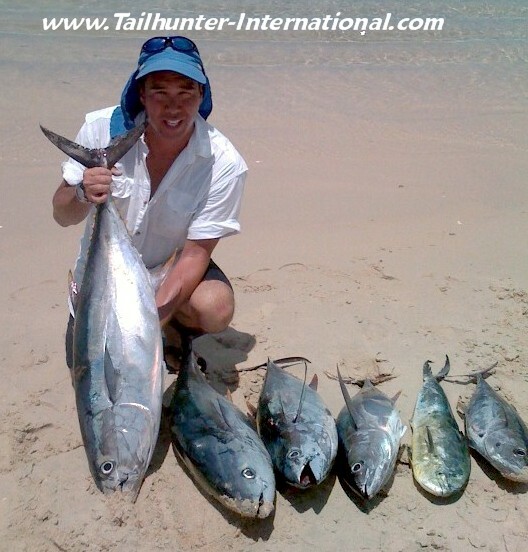 Jay Garcia fished several days with our Tailhunter Las Arenas Fleet and several days with our Tailhunter La Paz fleet. 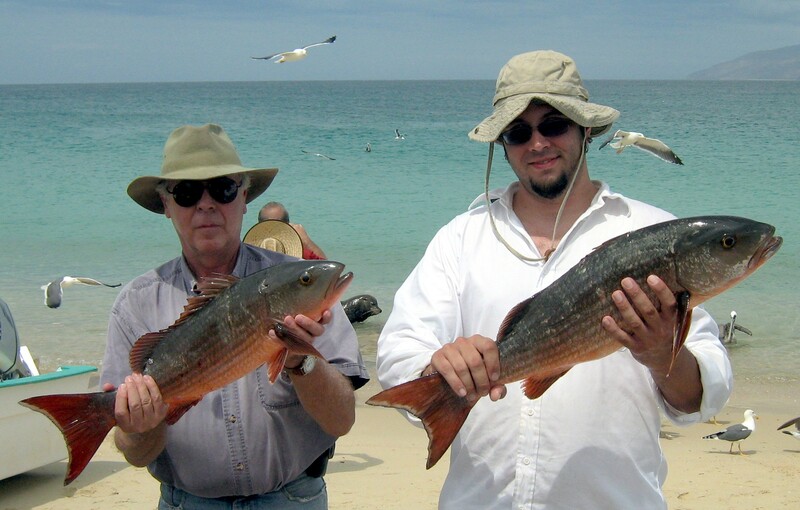 He got marlin, tuna, dorado, big roosterfish and several other species. 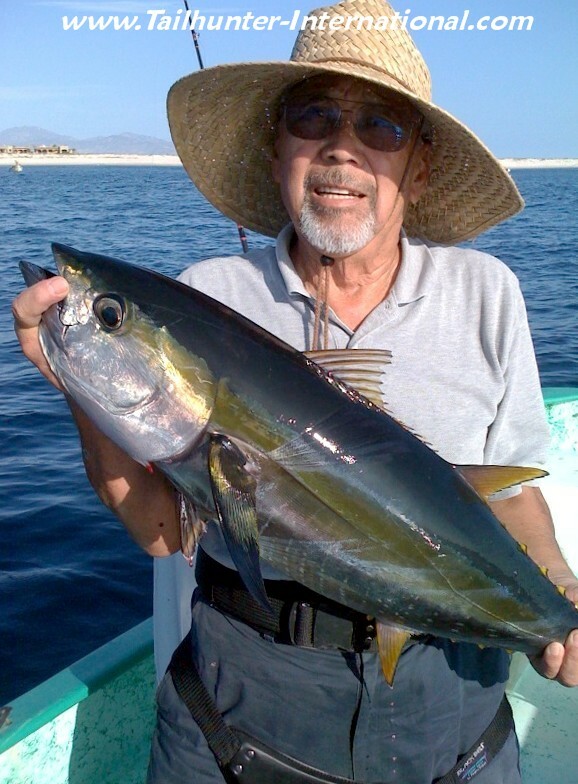 He's holding one of the nice bull dorado he caught with our La Paz fleet which is getting about 90 percent dorado these days, but some yellowfin tuna showed up this week near Rosario. It's that time of year when tropical storms can come up at any time. 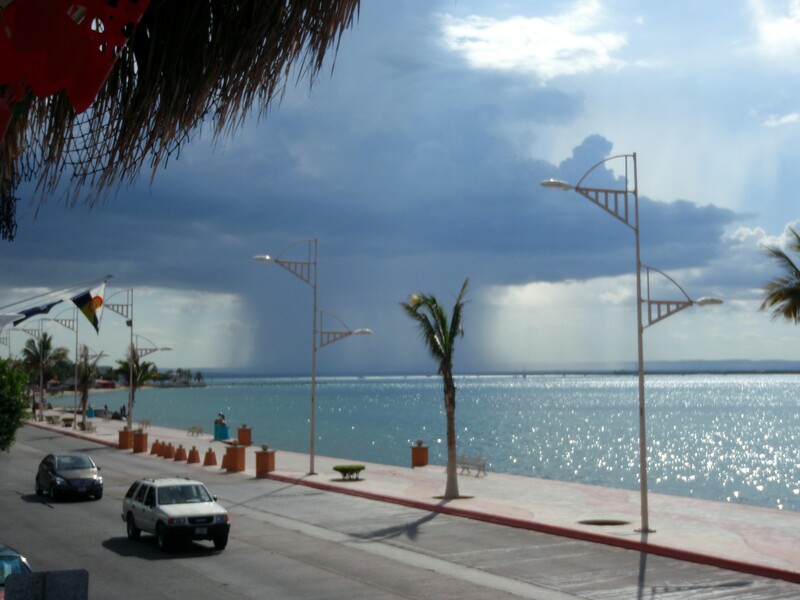 This ominous looking rainstorm showed up just off the La Paz waterfront one afternoon this week. But not even a drop hit the ground! Spectacular and even scary looking to watch as they get closer, it almost looks "nuclear." But often the rain dissipates or evaporates before it ever touches ground or you can simply walk or drive around the storms! 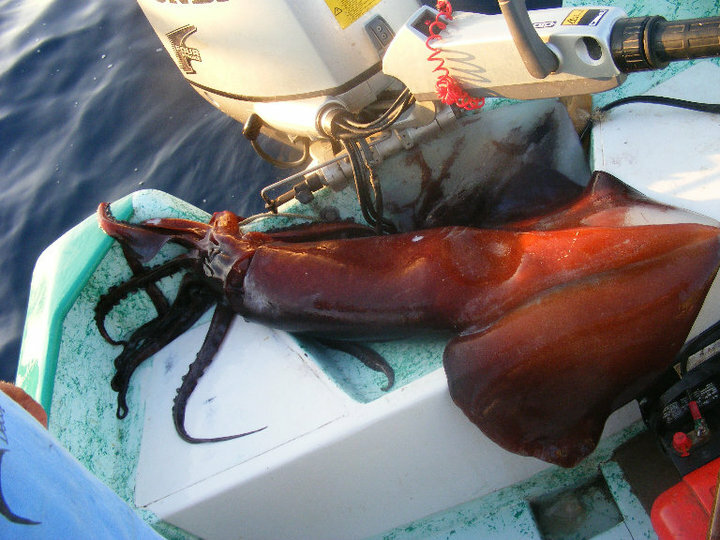 This is what a giant squid looks like. This is what we're using for bait right now for many of our fish...piece of it at least! They're fun to catch, but alot of work too as you might be able to tell from the face of angler Jerry Frickas. Lots of anglers are anxious to catch them until they actually go through it...then they want no more when it means pulling these things up from hundreds of feet down! Imagine starting your day drenched in sweat with aching arms even before you start REALLY fishing! Note the big squid jig held by Capt. Jorge. FISH GO ON THE CHEW AND KEEP ANGLERS BENT TO END THE SUMMER! The transition from August to September was seamless in terms of fishing. The hot bite continued like it has been for most of the summer in perhaps the best tuna and dorado season in a long time. You would think that with cooler temperatures and water and with bait being more difficult to find this year that fishing would have really diminished. On the contrary. 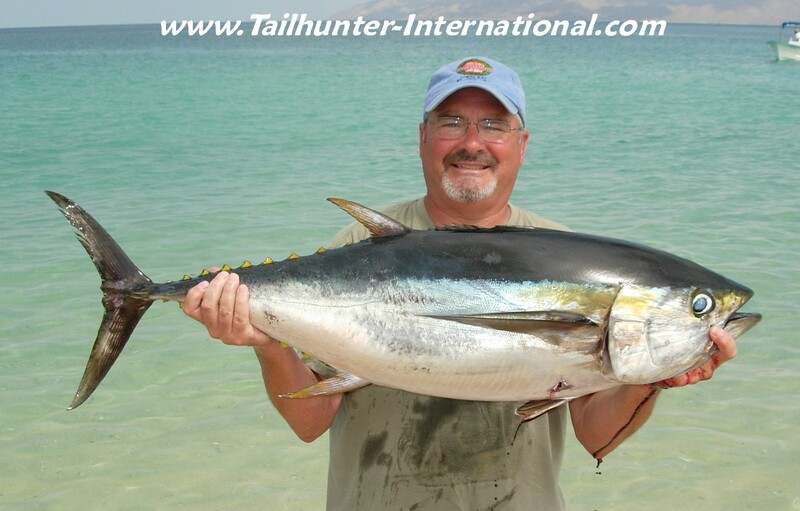 As in the past few weeks tuna in the 10-40 pound class are around almost daily and can sometimes be caught as stone’s throw from where we launch the boats. Dorado schools fire through and calm waters suddenly blow up with flashing gold, green and blue tipped mahi going after everything in the water fighting to get at whatever bait…be it sardines…dead chunks of bonito…or chunks of dead squid faster than anglers can cast. The dorado are getting bigger too! More fish in the 20-30 pound range were getting put in the boxes to the point where finally more of the smaller 10 pounders were getting released. “At one point, we were releasing fish as fast as we could go and still had three rods hooked up!” said one of our anglers. “We were back on the beach by 11 a.m. because we were just tired and didn’t have any more room for more tuna. We fought some fish over an hour with two fish on at once. We released a bunch of fish all week and still don’t know what we’re going to do with all the fish!” one other angler told us! As well, there continued to be a number of marlin hook-ups with all fish this wee either getting unbuttoned or released. Plus, the big roosters have not left! Fish in the 40-60 pound class are not uncommon in the sandy shallows and many reports of bigger fish and schools of larger fish have been reported daily. Temperatures took a big switch this week. Most of August actually felt like Baja summer with hot humid conditions after a cooler-than-normal summer. We actually fired up the air-conditioners! Tropical storms and occasional warm drizzle and thundershowers were commonly encountered daily. But late last week it was like someone threw a switch. The temperatured dopped by 10 degrees. The humidity diminished. Cool breezes started cooling things down. It’s really comfortable again. But the waters have stayed warm the the fish are still biting! Tak Okamoto from Gardena CA shows off the type of football tuna that continued to rip around the waters close to shore for our Las Arenas Tailhunter fleet. 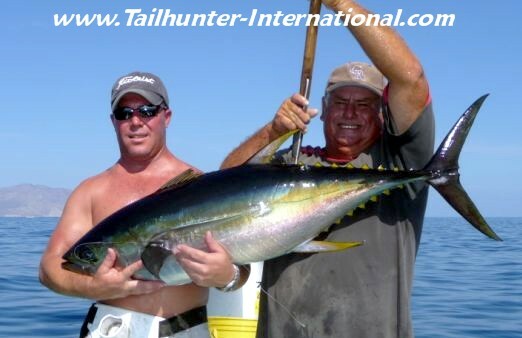 The tuna have been around now for over a month with larger fish up to 100 pounds also in the mix, but clients unable to stop the fish after long battles. Dorado for both of our fleets at Las Arenas and La Paz are here although we're still waiting for the larger bulls to show up. Normally, by this time of the year the larger 30-50 pound bulls are around, but so far, not much of a showing. 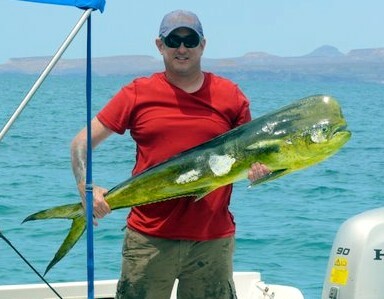 Rich Schumar of Los Angeles, however, holds up on decent bull mahi caught off Punta Arenas. Surprisingly, there are still some huge pargo running around the shallow waters and high spots despite the late season, but Craig Corda hangs one on the gaff in front of Captain Adolfo. The fish are eating chummed sardines and squid chunks. Many are hooked...few are landed! This is one of the larger 60 pound models that we keep hooking, but so few are every landed. There are some fish that guys fight for several hours and NEVER EVER see color. And then the line breaks...or the hook pulls out. Quite a few anglers shake their heads after losing fish never realizing how powerful a tuna can pull and telling me, they only want "smaller" fish in the future. Watch what you ask for. Carlos and Captain Jorge hold the "tweener" (in between a football-sized tuna and a big toad tuna) on the beach at Las Arenas. 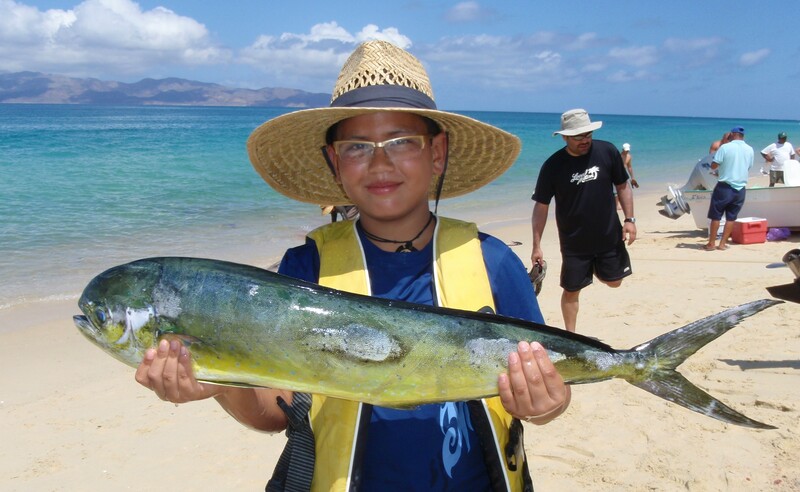 A good day no matter how you look at it for Chris Okamoto holding up a day's catch of tuna and dorado. 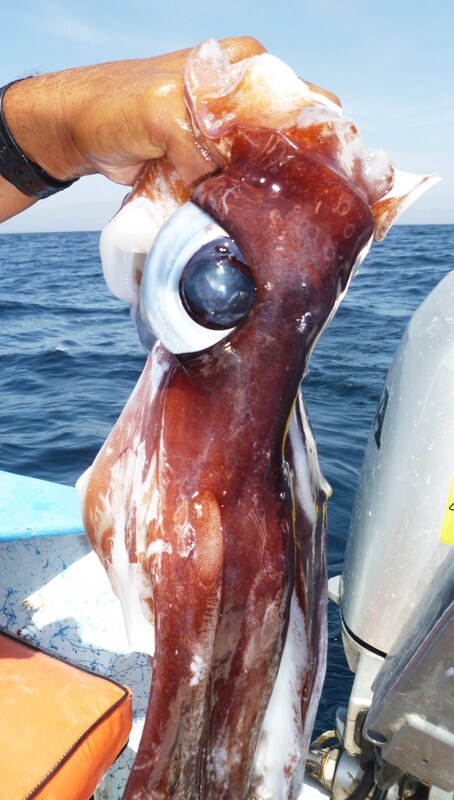 The head of a giant Humboldt squid. 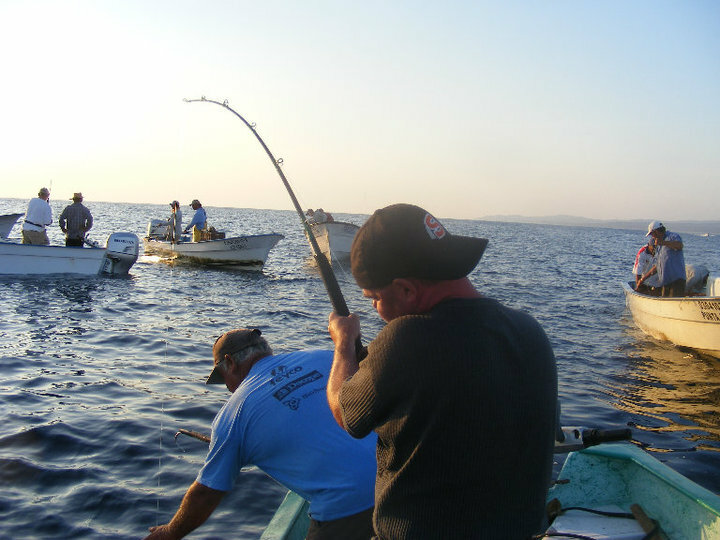 We're still using the big chunks for bait which has been effective on almost all our species...tuna, dorado, pargo, and cabrilla. 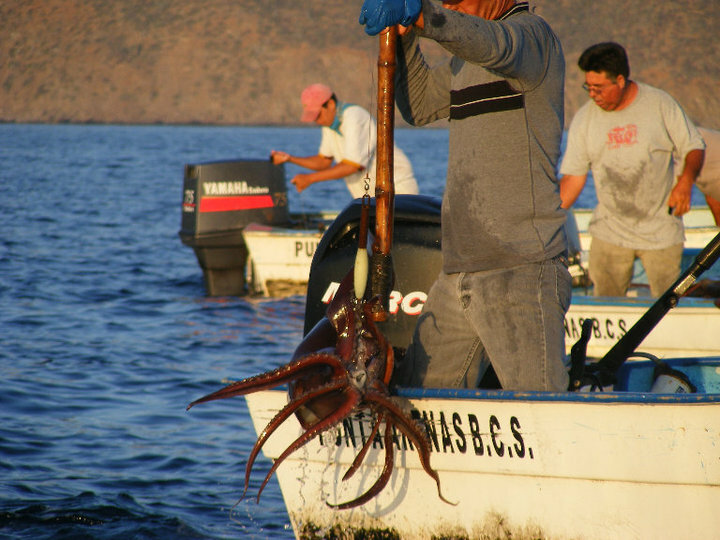 Catching the squid has been the tough part involving pulling up the giants from as much as 1000 feet down. 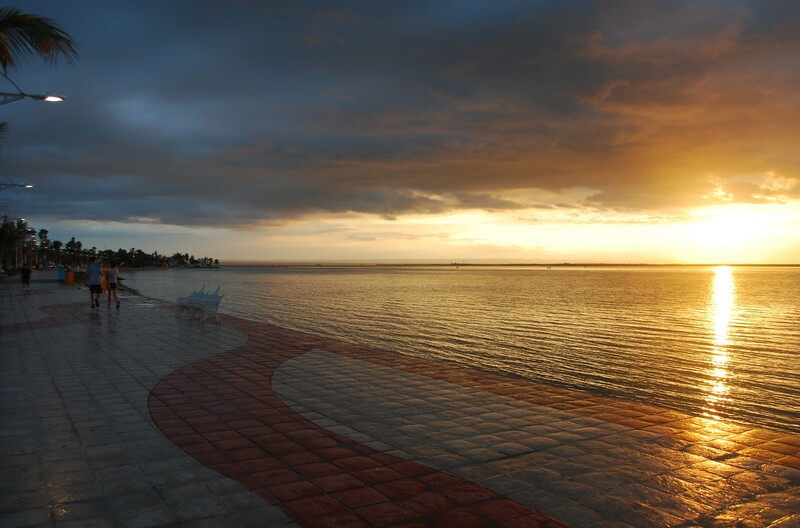 It's that time of year when warm showers and tropical drizzle can show up at any time making for some great sunsets each day on the La Paz waterfront. We spent a good part of the week keeping an eye on the computer wondering if a little “disturbance” about 600 miles south of La Paz was going to turn into a storm with a name. The other eye was kept on the fishing. Both turned out well! The “storm” turned into nothing but some grey skies in the morning. The fishing turned into some of the best fishing we’ve seen. Yes, if you’ve been watching our reports this summer, you know we’ve had some stellar fishing. It actually got better this past week. Guys were getting limits of tuna so early that they spent the rest of the day releasing fish or chasing wahoo, pargo or big roosters (more on the roosters later!). It was almost like fishing on a shopping list. You could almost pick out what kind of fish you wanted. The tuna were nice and manageable 10-25 pounders or if you wanted to “man up” you went for the big boys that kicked your behind for 1,2 or 3 hours and generally beat you to a pulp and you lost the fish. They are still eating the chunked giant squid we’re getting or big cabllitos or cocineros or sardines. Dorado? Lots of 10-15 pounders, but more in the 20-30 pound class that we have not been seeing most of the season. Real encouraging that we started seeing larger mahi. Marlin? 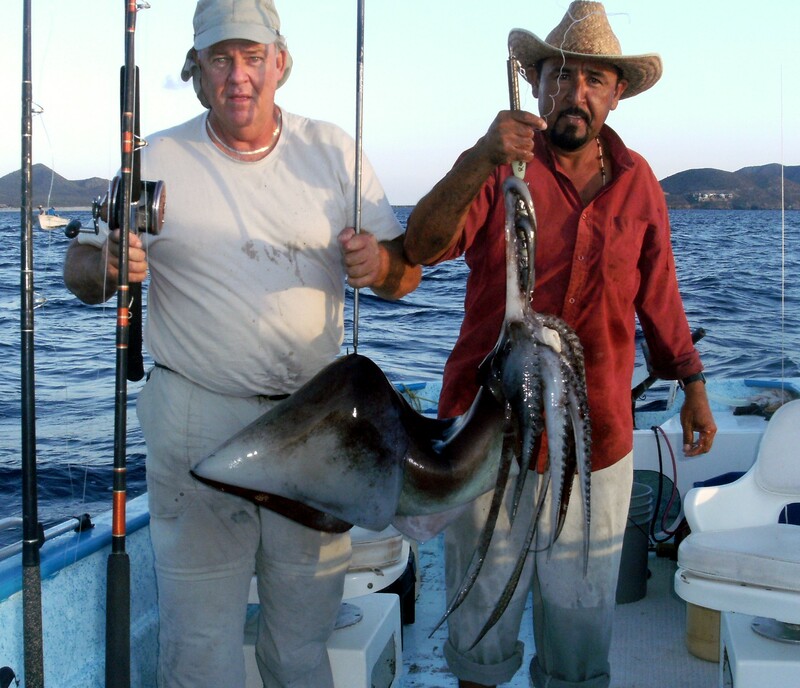 Several of our pangas caught and released multiple fish with most fish being released. 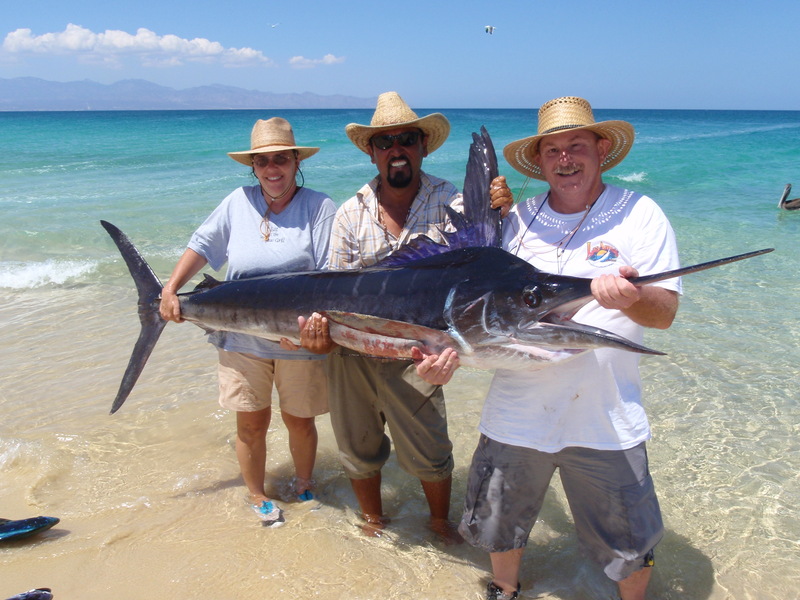 Largest was about a 300 pound blue marlin caught with our La Paz fleet. Roosterfish? 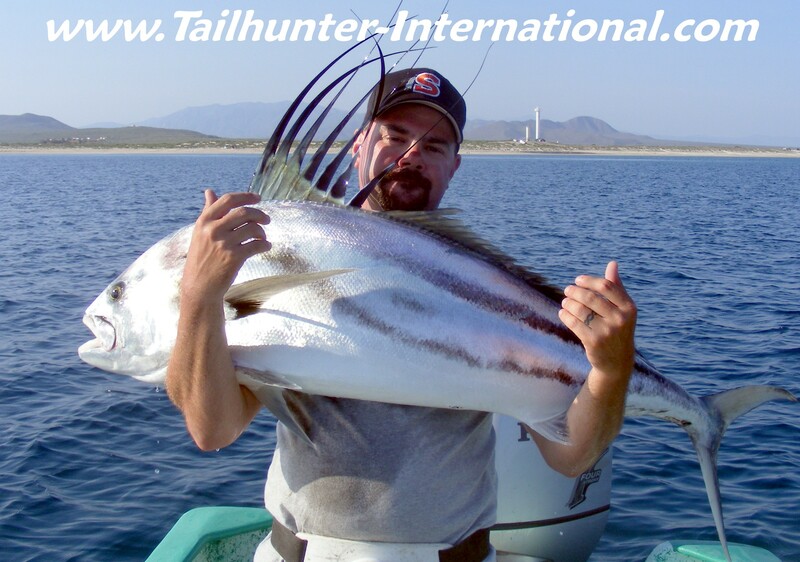 Several days this week might have been the best days for BIG roosterfish we’ve ever had this year. Every panga that we had fishing Las Arenas that day hooked 2-5 roosters with the smallest being in the 30-40 pound class and the largest in the 60-70 pound class. 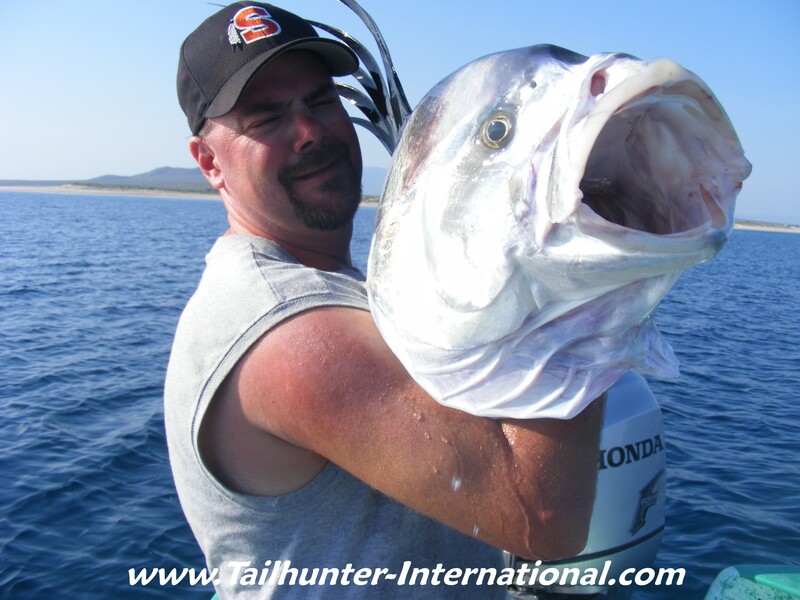 “We had several multiple hookups!” said one of our anglers. “I’ve always wanted a rooster and that day we caught big ones but also lost several other large ones!” All roosters were released. As long as the weather holds, we’re just coming into the high part of our season. Weather has been very very tropical the last 2 or 3 weeks. Little showers are almost a daily occurrence with some great evening lightning and incredible sunsets. So far, we’ve been lucky with no big storms All season, we’ve been talking about how the waters and weather are cooler than normal. That very phenomenon has kept the big storms away. As the storms come up from down south, they need the warm waters to keep them fueled. Instead, they are hitting the cooler waters of Baja and dissipating. Fingers crossed!